My marathon training plan is for 5 runs a week and I have to admit that I’ve been stuggling to fit them all in, especially during the school holidays, while on the Isle of Wight and having visitors. In the 4 weeks since I started I’ve only managed to run 5 times in the week of Thunder run and 3 of those runs were on the same day so that’s probably cheating. Some weeks I’ve felt a bit stressed about the fact I’m not doing all the runs I’m supposed to until it dawned on me that rather than beating myself up about not being able to follow this marathon training plan and throwing in the towel, I just have the wrong plan for me and I should get a new one. So I had a look around on the internet and was very happy to find the Runners World Smart Coach which suggested 3 runs a week (with 4 days rest, or cross training which I can add when I get back to BMF etc in a couple of weeks). The long runs are the same but there is longer mileage in one of the mid-week ones. Not rocket science as my son had already suggested I should just do fewer but longer runs. However the problem with this plan is that it is a little more technical with speed and tempo intervals, which I really should do, but 3x1600m at a precise pace is not necessarily possible on an uneven trail, round bendy roads when car dodging nor if the next 1600m is straight up a hill. So, my new plan is… No plan! Well until September at least. I am simply going to continue to do my gradually increasing long runs as well as trying to increase my total mileage by 10% each week, in whatever combination of runs I can. While I’m on the subject of change of plans… I had planned to run the Isle of Wight Half Marathon today. However, I really didn’t fancy an undulating road race, starting at 11am in temperatures of 26 degrees. A race that will have to wait for yet another year to run. 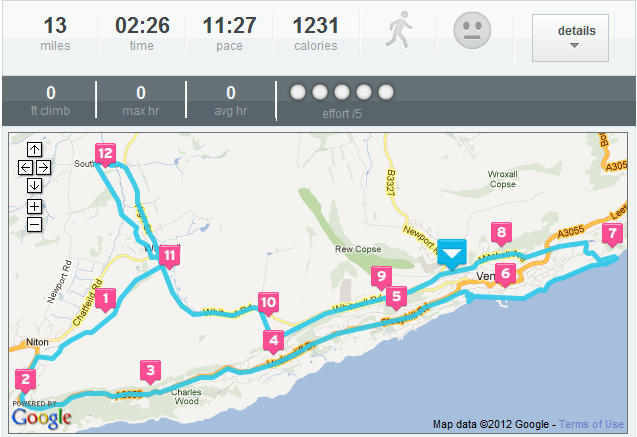 Instead I went out early (for me) at 8am and ran a slow loop of tree-shaded road, seafront and trails. A great route but tough going as it was already pretty hot. I also need to pay a little more attention in route planning for next time because I didn’t reckon on the non-stop climb back up from sea level between miles 7 and 9. Categories: fitness, running | Tags: Isle of Wight, marathon training, Running, running training plans, Rutland Water Marathon | Permalink. Five days a week training plan is hardwork 3/4 more reasonable. Well done on your long run today. Eeeuuuwww. That looks like an evil hill. Well done for fitting in your long run despite the heat. I totally agree with you: increasing your mileage with No Plan is much better than having trouble to stick to the Master Plan. 26 degrees yuck – you made the right decision! Great run – seems your training is going well!